My interest began with a Finnish band I got into. I saw them twice in Manchester; they're long since departed. They sang in English, but I encountered the language on a fan forum and was intrigued. 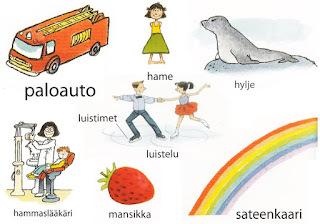 When the forum's lady boss explained a bit about it, including such nuggets as there not being a verb 'to have', I went and got the Teach Yourself book, and duly found that that was only a small part of the weirdness and that Finnish truly is a very different kind of language. When I started to listen to some Finnish language bands, I couldn't get over how attractive it sounded. To me, anyway. I went back to the Teach Yourself book, and found in the back of that some internet links. 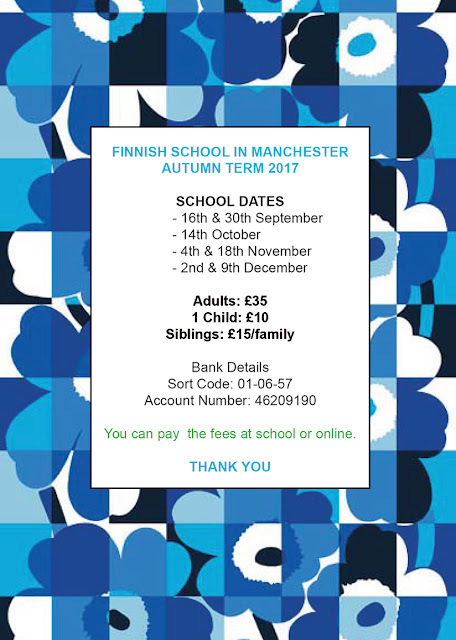 To my amazement, I found there were some actual Finnish schools you could go to, and one of them was in Manchester. We're in Sale, just off the M60. As you can see from the other pages, the school opens on alternate Saturdays, more or less, seven times in the autumn and ten times between the New Year and early summer. The location is good: the Centre at St Mary's is pleasant, has plenty of parking space, ample space inside with cafe facilities and several meeting rooms. For some while now the school has organised three children's groups and three adult groups. The numbers vary from session to session, but the classes continue to run happily and the central area becomes highly social at break times :) We have extended times for a Christmas party and a Spring party. We often organise a Vappu picnic (rain has not been our friend for that at times! ), sometimes a pub lunch, and at least once a year an 'activities day', when instead of normal classes we set up some role play. Special events have included language weekends in the Peak District and historical talks. 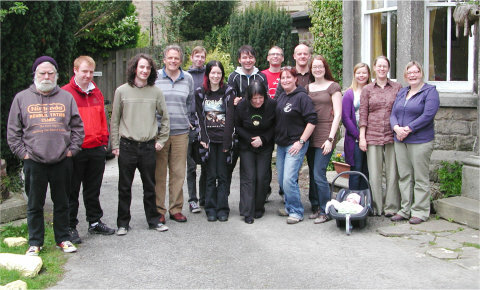 Right: Some of the guys who came along to our weekend in Hathersage in May 2010. Yes people, that is what we looked like. 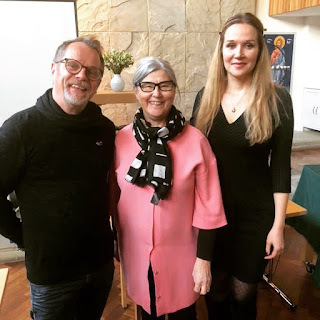 Obviously, the reason for the creation of the Finnish schools is to support the many Finnish people who have settled in England, especially those with young children. Having adult classes is a bonus. So, who comes to them? In my experience, it's a mixture of reasons. Firstly, there are the English partners of Finns who have encouraged (that may be a euphemistic word!) them to come along. Secondly, there are some who expect to be going to Finland for a while, maybe for work or study. Then there are those who have found a liking for some aspect of Finnish culture and find a good point of contact in the Finnish school. If you've read this far, and you don't know the Manchester school, maybe you'll consider giving us a visit? As you may guess, I've carried on coming way beyond any narrow study of the language. I've made a lot of friends here, I visit Finland each year, and of course coming to the school maintains the continuity. Did you know Finland also has the world's highest per capita consumption of coffee? The school offers that, and some very tasty home baking too. Not to mention a very well stocked shop full of Finnish treats. My only complaint is the weight I've put on with all that cake.